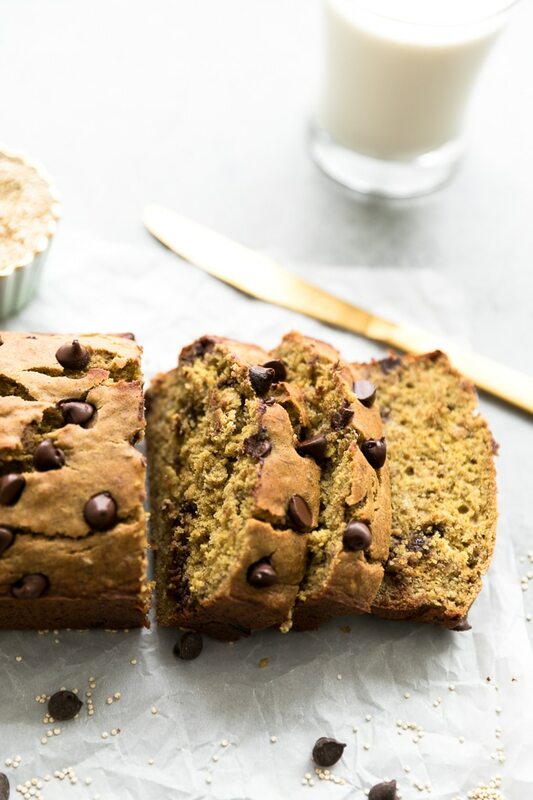 This banana bread is made with quinoa flour so it’s higher in protein and fiber than your typical banana bread! It’s sweetened with maple syrup and contains no refined sugar. And you can’t forget the chocolate chips! My love for banana bread runs deep. 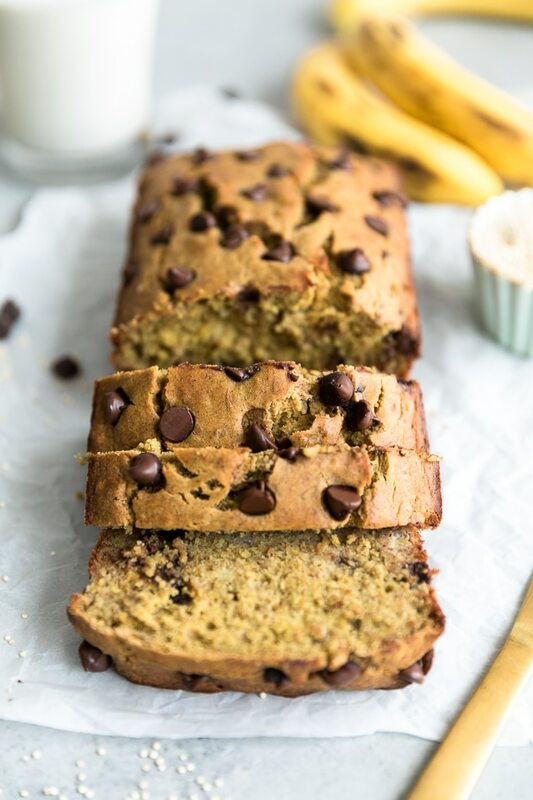 I haven’t shared a banana bread recipe in a while which is crazy because it’s one of the most delicious things ever! See also this, this, and this. All older recipes, but all insanely good. This recipe has actually been on my blog since 2016, (and it’s the most popular recipe on my site!) so I wanted to refresh it with some new photos for you guys! 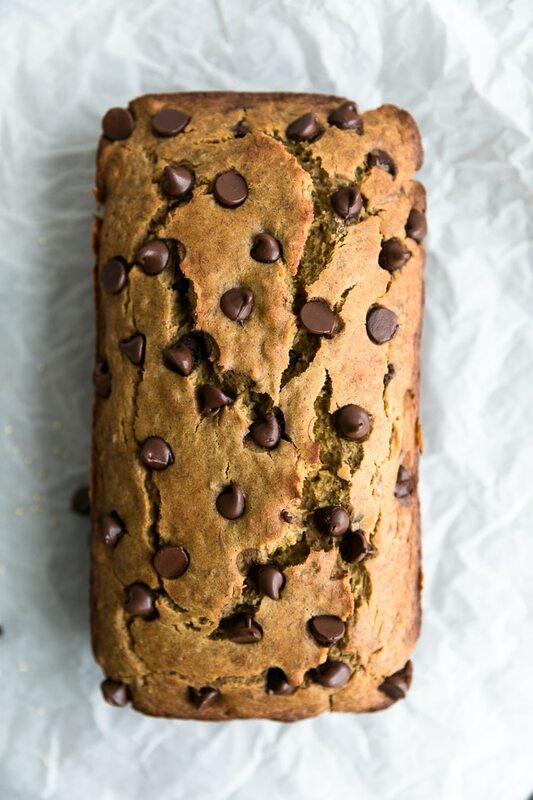 I mean, who doesn’t love banana bread? It’s so comforting and just all around delicious, especially when chocolate is involved. This recipe is no exception. I absolutely LOVE experimenting with alternative and healthier flours with higher protein and lower carb content. This bread is also naturally sweetened with maple syrup, so there’s no refined sugar, and it’s gluten free and dairy free as well. I’m not gluten or dairy free, but I know a lot of you are! Quinoa flour has a little more distinct of a taste than regular all purpose flour or oat flour, but I personally love it. It’s little earthy and nutty. I love that it’s high in protein too, and it won’t make you feel weighed down. I can’t tell you how many times I’ve made banana bread with all purpose flour, butter or oil, regular sugar, and sour cream, and eaten nearly the entire loaf in a day. And then I don’t feel so great. Hey, it happens! 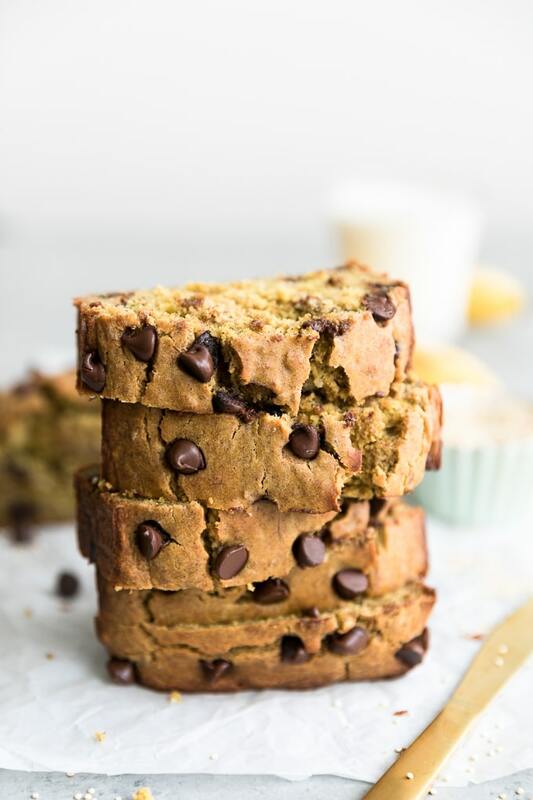 I have nothing against making banana bread with the “real stuff,” but this recipe is an amazing option when you want something a little more healthy and nutrient-rich! I actually prefer baking with the “real stuff” 80% of the time, but it’s nice to change things up! 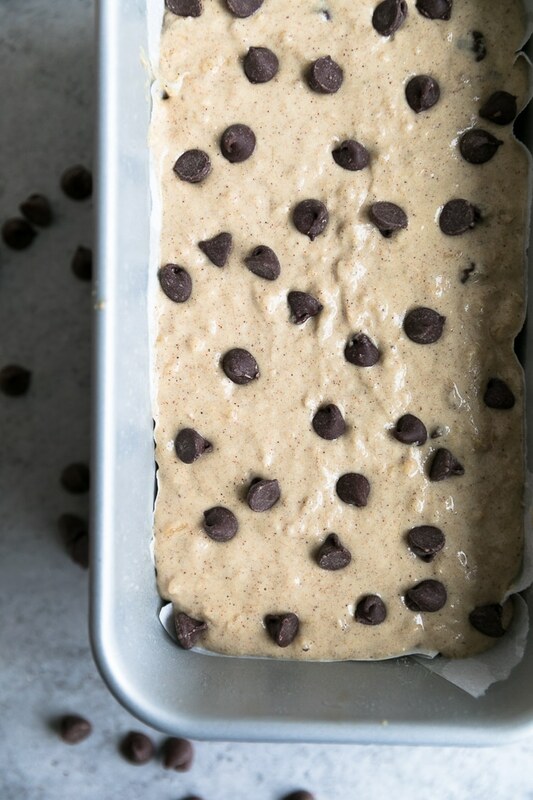 Extra chocolate chips on top is never optional. Am I right?! I mean, look how incredible this looks! It seriously looks like regular old banana bread. I can’t even believe how incredible it tastes. You’ll be blown away at how moist and flavorful it is. Everyone that tries it is in love! This recipe is healthy enough for breakfast or a snack, but makes a great dessert too. The only issue is again, trying not to eat the whole loaf. The recipe is super simple and only twelve ingredients. Likely all things you have on hand! Except for maybe the quinoa flour, which you can find in any natural foods grocery store or you can buy it here! I mean, look how moist it is?! Which is pretty incredible because you usually have to use lots of sour cream/Greek yogurt and/or oil and butter to get quick breads to be super moist. This one only has a quarter cup of coconut oil. Unreal! 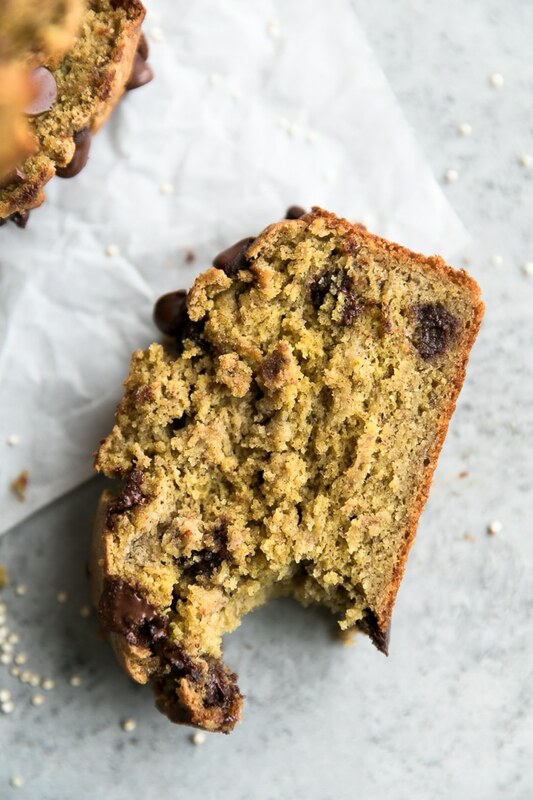 The bananas and the quinoa flour work together to create the most perfect consistency. Can you tell how much I love this bread?! You must try it. This is delicious slathered with a little peanut butter or almond butter too..because what isn’t?! 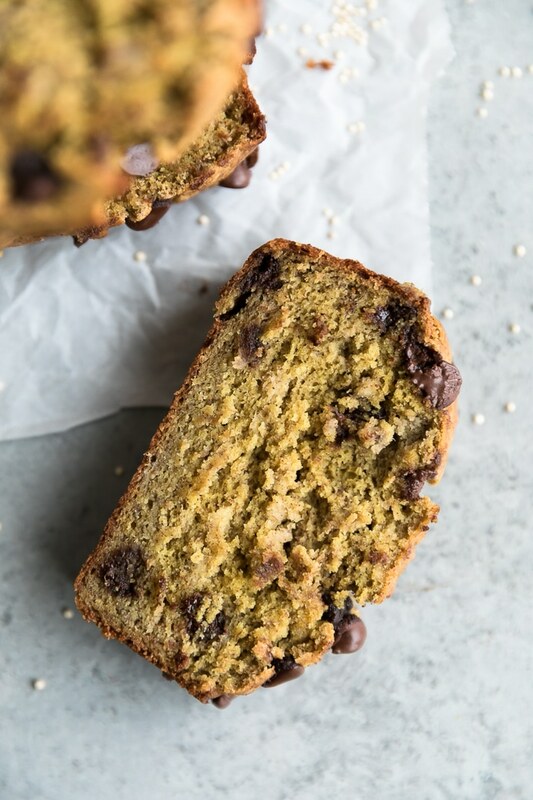 This banana bread is made with quinoa flour so it's higher in protein and fiber than your typical banana bread! It's sweetened with maple syrup and contains no refined sugar. And you can't forget the chocolate chips! Preheat oven to 350℉. Spray a 9x5 loaf pan with coconut oil or nonstick spray, and line the bottom of the pan with parchment paper. (I always do this to ensure it doesn't stick). Combine quinoa flour, baking powder, baking soda, salt, and cinnamon in a medium bowl and whisk to combine. In a separate bowl, combine mashed bananas, coconut oil, maple syrup, egg, vanilla almond milk, and vanilla, and whisk until thoroughly combined. Gradually add the dry ingredients into the wet, folding with a rubber spatula until just mixed. Fold in the chocolate chips. 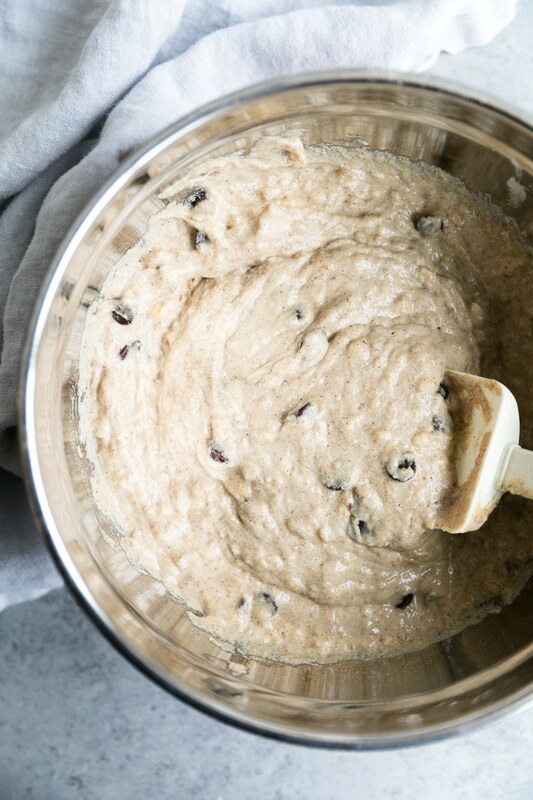 Pour into loaf pan and top with additional chocolate chips if desired. Bake for 42-47 minutes or until golden and a toothpick inserted comes out clean. Cool for 15 minutes then invert onto a cooling rack and cool completely before cutting into slices. This post was originally published on 6/22/16, but was updated with new photos and text on 1/25/18! If you try this recipe, remember to share on Facebook, Instagram and/or Twitter and hashtag #spicesinmydna so I can see your creations! Thanks Grace! Unfortunately I haven’t tested the recipe with dates or stevia, so I can’t really recommend an amount. Let me know if you try it though and either of those work!! Can flax egg be used? I have an egg allergy. I haven’t tested it with a flax egg, so I can’t guarantee it would work. I want to say yes but I don’t know for sure. Let me know if you try it with the flax egg and if it works! I used a chia egg. It worked great! That’s great to know!! I’m so glad!! Thanks for letting me know! 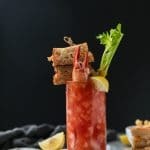 Hey, this looks like a great recipe, but I’m looking to substitute the egg, any ideas? Also, instead of almond milk, I would like to use coconut milk, thoughts? Hi Lukasz! I haven’t tested the recipe with any egg substitutes, but coconut milk should work here! This is so yummy.. I try hard not to finish it all by myself. Thank you so much!! It’s one of my faves too! Hi can I put these in muffin tins? Yes absolutely! They would take a lot less time, and I haven’t tested the timing on that, but they should definitely work! I made this once and decided that this is my goto banana cake recipe from now on! I’ve just made it a second time and put a little less cinnamon in it, as the caramelised flavour is overpowering when coupled with quinoa and dark chocolate. My husband can’t wait to try it when he comes home, it looks delicious in photos! Fantastic recipe! My whole family enjoyed it, and many didn’t even realize it was made with quinoa flour. I’ve made it twice now; once as bread, and once as muffins. Delicious both ways. Thank you so much for sharing. I just made this today with organic banana baby food b/c I didn’t want to wait to ripen 3 bananas. It tastes delicious! I wonder if I can try to make this with some pumpkin puree or baby food for a more fall flavor. I’m just not sure if pumpkin will bind as well as banana. Any thoughts? Make sure all the ingredients are at room temperature. On my first attempt making this recipe the melted coconut oil hardened as soon as I added the vanilla almond milk and eggs, which had been in the refrigerator. I would also heat the bowl with hot water prior to adding all the ingredients. I have had to be gluten free for over a year. I just made a quinoa crust pizza which was so-so, but this bread is AMAZING! I will also be trying with pumpkin. Thank you so much for sharing this!!! Thank you SO much Bridgett!! I’m so glad you loved it! I played around with a pumpkin version this fall and never got around to perfecting it and posting it – but it’s on my list of to-do’s! Let me know if you try it! 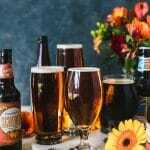 Thank you so much for posting and sharing this recipe it is so deliciously decadent and perfect for this time of year!! I used dark chocolate morsels and it came out just amazing!!! 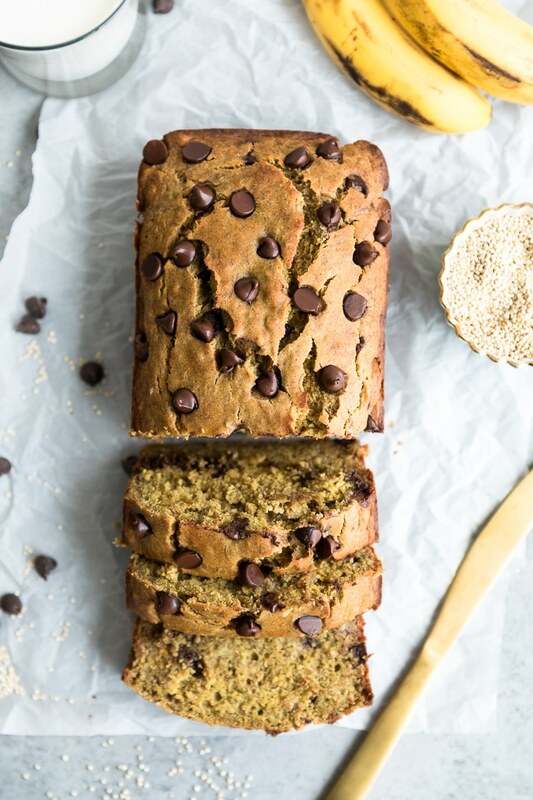 Me and my daughter LOVED this take on banana bread, definitely sharing!! Thank you SO much Catalina!! I’m so happy that you and your daughter loved it!! I personally haven’t frozen it, but I’ve frozen other banana breads before with success. I think it would be fine, but I can’t say for sure. But let me know if you try it! Thank you so much Nalini! Pleasantly surprised! I can’t say how many new recipes I try with ingredients I have at home that dont turn out! My gluten eating husband even said, it doesn’t even taste gluten free! And he NEVER says this, nor does he spare my feelings LOL. I followed the recipe exactly except for the coconut oil, I was out so took a chance and used olive oil! It worked! I also used it to coat the bread pan, didn’t use wax paper as I had none, and it came out of the pan perfectly! Thank you so much for this recipe, I was starting to give up on baking gf!